MANZANILLO, Mexico — Hurricane Patricia headed toward southwestern Mexico Friday as a monster Category 5 storm, the strongest ever in the Western Hemisphere that forecasters said could make a “potentially catastrophic landfall” later in the day. Residents of a stretch of Mexico’s Pacific Coast dotted with resorts and fishing villages on Thursday boarded up homes and bought supplies ahead of Patricia’s arrival. With maximum sustained winds near 200 mph, Patricia is the strongest storm ever recorded in the eastern Pacific or in the Atlantic, said Dave Roberts, a hurricane specialist at the U.S. National Hurricane Center. Patricia’s power was comparable to that of Typhoon Haiyan, which left more than 7,300 dead or missing in the Philippines two years ago, according to the U.N.’s World Meteorological Organization. In Mexico, officials declared a state of emergency in dozens of municipalities in Colima, Nayarit and Jalisco states that contain the bustling port of Manzanillo and the posh resort of Puerto Vallarta. According to the 2010 census, there were more than 7.3 million inhabitants in Jalisco state and more than 255,000 in Puerto Vallarta municipality. There were more than 650,000 in Colima state, and more than 161,000 in Manzanillo. Rain pounded Manzanillo late Thursday while people took last-minute measures ahead of Patricia, which quickly grew from a tropical storm into a Category 5 hurricane, leaving authorities scrambling to make people safe. At a Wal-Mart in Manzanillo, shoppers filled carts with non-perishables as a steady rain fell outside. Veronica Cabrera, shopping with her young son, said Manzanillo tends to flood with many small streams overflowing their banks. She said she had taped her windows at home to prevent them from shattering. Alejandra Rodriguez, shopping with her brother and mother, was buying 10 liters of milk, a large jug of water and items like tuna and canned ham that do not require refrigeration or cooking. The family already blocked the bottoms of the doors at their home to keep water from entering. Manzanillo’s “main street really floods and cuts access to a lot of other streets. It ends up like an island,” Rodriguez said. In Puerto Vallarta, restaurants and stores taped or boarded-up windows, and residents raced to stores for last-minute purchases ahead of the storm. The Hurricane Center in Miami warned that preparations should be rushed to completion, saying the storm could cause coastal flooding, destructive waves and flash floods. “This is an extremely dangerous, potentially catastrophic hurricane,” center meteorologist Dennis Feltgen said. Feltgen said Patricia also poses problems for Texas. Forecast models indicate that after the storm breaks up over land, remnants of its tropical moisture will likely combine with and contribute to heavy rainfall that is already soaking Texas independently of the hurricane, he said. “It’s only going to make a bad situation worse,” he said. In Colima, authorities handed out sandbags to help residents protect their homes from flooding. By early Friday, Patricia’s maximum sustained winds had increased to 200 mph — a Category 5 storm, the highest designation on the Saffir-Simpson scale used to quantify a hurricane’s wind strength. 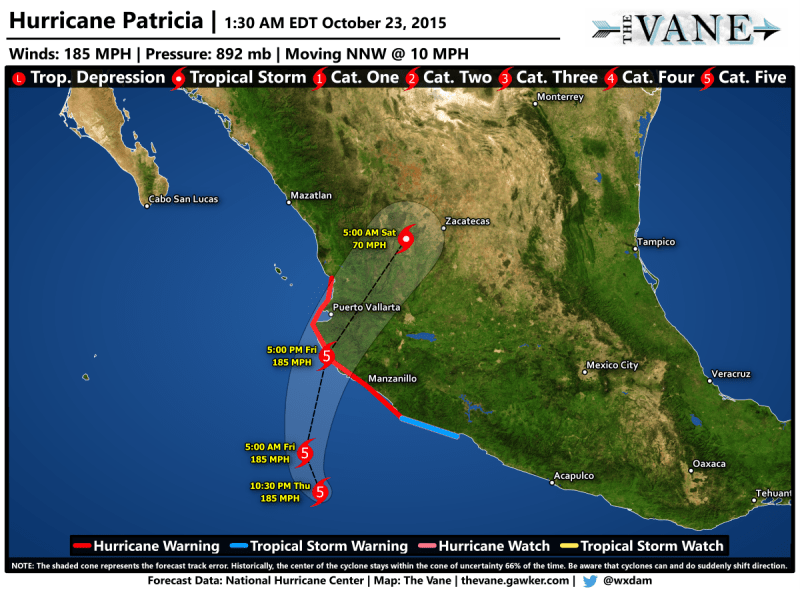 Patricia was centered about 145 miles southwest of the Pacific resort of Manzanillo early Friday and was moving northwest at 12 mph on a projected track to come ashore between Manzanillo and Puerto Vallarta sometime Friday afternoon or evening. Some fluctuations in intensity were forecast before then, but the Hurricane Center said it was expected to be an “extremely dangerous” Category 5 storm when it made landfall. A hurricane warning was in effect for the Mexican coast from San Blas to Punta San Telmo, a stretch that includes Manzanillo and Puerto Vallarta. A broader area was under hurricane watch, tropical storm warning or tropical storm watch. The Hurricane Center said Patricia was expected to bring rainfall of 6 to 12 inches, with isolated amounts of up to 20 inches in some locations. Tropical storm conditions were expected to reach land late Thursday or early Friday, complicating any remaining preparation work at that point.